First published in Frogpond 14:4, Winter 1991, pages 32–33. Senryu: Poems of the People, by J. C. Brown. Charles E. Tuttle Company, Rutland, Vermont. Hardback, 6½ by 5⅛ inches, 94 pages, 1991. ISBN 0-8048-1664-6. $16.00. The distinctive quality of Tuttle publications has long been legend in the haiku community. 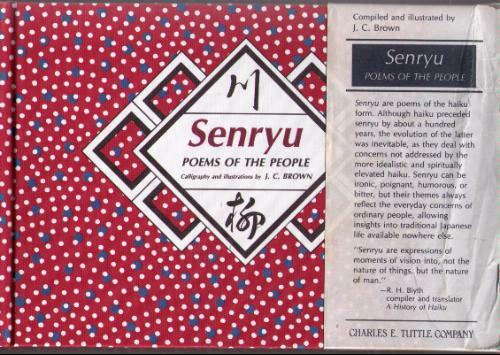 Once again, with J. C. Brown’s Senryu: Poems of the People, Tuttle has produced a glorious volume. You could read the book in fifteen minutes flat if you wanted, but you will surely savour it for hours and days beyond. In both its art and deceptively simple poems, this is a sensuous book, ringing with the truth of everyday observation. Profusely illustrated in sumi-e style by the author/translator, this book is a visual treat. Each poem is given in English and romaji, with an illustration and Japanese calligraphy (hentaigana) spread over two pages. The forty-three poems date from the eighteenth to the twentieth century, with two attributed to Santarō, and one each to Shūjin, Shōichi, Shigeo, Kimbō, Shōtarō, Kenkabō, Keisen, Kōbō, Kimiko, Kaishinji, Kahō, Shittarō, Genkaibō, Yasharō, Gokason, and Kenjō (in order of appearance). The remaining twenty-five poems are unattributed; one can only assume they are Brown’s [they are not identified as anonymous]. Most all poems are a treat to the eye, ear, and mind. You will chuckle or sigh at many of these poems, each sensitively amplified by its illustration. I am pleased to add this book to my haiku library, and I would highly recommend that you hunt for this volume at your favourite bookstore. These are poems of everyday life, of subjects that we don’t often see as well as we should. As J. C. Brown concludes in this somewhat expensive but richly rewarding book, “poetry can be found in anything.” And although it takes talent to turn “everything” into a poem, Brown has succeeded here with this marvelous collection of senryu. On revisiting this review, I am struck by three thoughts. One is that Brown’s relatively disparagement of haiku seems unnecessary and, to some degree, ill-informed, at least regarding English-language haiku. One may need to be a near genius to write a good haiku, but I would say the same challenge also applies to senryu—and that the ills of haiku, as Brown sees them, apply equally well to senryu. Brown’s obvious bias does not help his cause. It is true that senryu is “looser” than haiku, but while a senryu may evoke a chuckle, that may be all it evokes, thus resulting in a shallower and ultimately more superficial poem. Paul O. Williams has written how haiku engages the reader (he or she finds reverberations and layers of meaning), while senryu detaches the reader (he or she detaches from reality for a moment, then moves on, forgetting the poem that may serve as little more than a diversion). The situation between haiku and senryu isn’t quite a simple as Brown would have us believe—nor as simple as the engagement and detachment of haiku and senryu I’ve described here. My second thought is that the poem “Never giving away” strikes me as entirely a haiku. The cicada reference is seasonal, and the subject of mortality certainly speaks more to haiku than to senryu. Or, as Brown himself says, “the main difference between senryu and haiku is one of tone.” I have to wonder how this poem is a “senryu” in tone. My third thought is that this book has not aged well. It’s still a tactile treasure, beautifully made, and lovely to look at, but its influence has been minimal in deepening anyone’s understanding of either haiku or senryu, let alone the difference between them. It is refreshing to see that these poems (translations and originals in English) do not fall prey to the 5-7-5 myth, and the illustrations and calligraphy are pleasing, but this collection remains in the realm of being simply a gift book.